I was invited to Sardinia, Italy by Volkswagen to drive the new Passat that made its first public appearance at the Paris Motor Show this year. Volkswagen says that all the media drives previously held at the island yielded favourable results for the models driven - the current generation Golf and Polo, for instance. Volkswagen therefore continued the tradition for the Passat B8 as well. It's an important model for Volkswagen, with the German carmaker selling as many as 3,000 units of the Passat in a day. India does contribute to that number, but not significantly so. The eighth generation Passat could change that. The Volkswagen Passat is based on the company's new modular platform - the MQB - and will be the first sedan from Volkswagen to implement the new transverse matrix for engine, transmission and chassis configurations. As many ten engine options, three transmission types and three body styles are expected to be offered by next year. Out of these, a 2.0-litre TDI variant with a six- or seven-speed dual clutch gearbox in the saloon form factor is the obvious choice for India. We sampled two different 2.0 TDI configurations - a turbocharged mill good for 150PS and around 350Nm and a bi-turbo variant that puts out about 240PS and 500Nm. The enormity of the torque from the latter compelled Volkswagen to incorporate a four-wheel drive system to optimally put the force down to the road without erratically wearing the tyres off or unnerving the driver with unwanted torque steer. The car we drove came with a seven-speed DSG gearbox. But given the cost implications of this setup and limited application of four-wheel drive for the Indian weather conditions, only the 150PS diesel variant with a front-wheel drive and six-speed DSG is likely to head to our shores. We drove both the versions of the Volkswagen Passat on the Sardinian roads. The 240PS variant is a quick car. When you put your foot down, it builds up torque quite rapidly and four-wheel drive helps the car move forward without any drama whatsoever. On part throttle, it feels utterly eager to move up through the gears, but that is a trait attributed to the seven-speed DSG gearbox. It's in the stop and go traffic where the difference in the tuning of both the variants is evident. The 240PS variant takes a while to respond to throttle inputs at lower rpm in lower gears. The 150PS version has a comparatively sharper low end response, but you don't get any transmission shock. Despite its lower power and torque, it has a fairly healthy mid-range pull too. It's only when you need to pull rolling overtakes that you realise that the gearbox drops a gear or two and revs quite high to get you the desired torque at that instant. The Passat also lets you choose between various driving modes. The Sport mode, as you would expect, makes for a more eager engine response, while Comfort and Economy modes are sober, meant for city driving, with gear shifts around the mid-range. The diesel engine makes its note clearly audible between 4,000 and 5,000rpm and has a likeable tone to it unlike the gravelly note you find on most oil burners. The cabin is quite silent at city speeds, but tyre noise did kick in on hitting 120kmph on the coarse Sardinian roads. The suspension has always been noisy on the Passat and you still get those thudding sounds even on the new setup. That said, the suspension doesn't bottom out and even on rutted surfaces, the ride isn't choppy. At high speeds, around the bends, the setup does feel a tad squishy on the turn-ins, but doesn't rebound too hard and therefore on switchbacks or a series of bends, it doesn't make the car wallowy. The 150PS version, with its front-wheel drive configuration, feels more nimble than its four-wheel drive counterpart. Since the wheels have now moved further outward towards the corners of the car, it also feels better balanced than its predecessor. What I also like is the new steering setup, which Volkswagen calls Direct Steer. Since it uses a variable ratio gear, it remains light at city speeds but feels direct as you gain momentum. I would have liked it to be slightly stiffer at highway speeds or on quick switchbacks. But then, we are in Audi territory, not BMW. The steering system now comes with new assistance systems like Lane Keep Assist and Lane Departure Warning. I'm not sure if they will make it to the India-spec models. Interestingly though, the new Passat comes with proximity sensors even on its sides, to warn you of low kerbs and items in your blind spot. Volkswagen has also thrown in a bird-eye view camera and a front camera with a 170° field-of-view and it does come in handy when driving out of parking spaces and while entering blind intersections - more so in driving conditions like ours. These are small additions but nifty in the car's daily life. The eighth generation Passat also debuts Volkswagen's evolved design philosophy. It has a sharper appearance overall and now conforms to that German mafia car image that some of its group siblings at Audi enjoy. Since the engine is packed more tightly, the bonnet is lower, allowing for a sharper rake angle for the front windshield. It instantly makes the Passat B8 look low-slung like the current Passat CC. 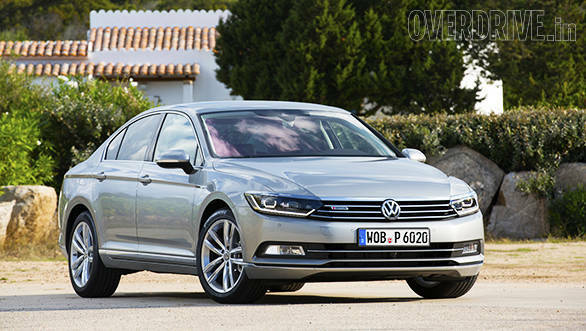 In fact, there are strong hints of the Passat CC throughout the new design. The headlights are larger, but look more streamlined thanks to their tapering outer edges. The grille is larger and still comes with four slats, but the top-most one extends over the headlights to form a chrome brow. The headlight cluster now gets LED headlamps and distinctive LED DRLs. LED patterns are hard to master and can often end up looking overdone, but Volkswagen has managed to pull off a simple, fine looking design. The tail lights have a shape largely similar to that of the outgoing car and these too get a healthy dose of LEDs with unique patterns for the tail and brake lamps. The changing pattern is more efficient at attracting attention of the following traffic and in turn, reduces the reaction time required to respond to your braking action. The side profile has minimal lines and therefore the design doesn't look busy. The Passat's long nose and the prominent shoulder line that runs along the door handles, make the new model look exceptionally long, but it is in fact shorter than its predecessor. The height is shorter too, while the width is marginally longer. 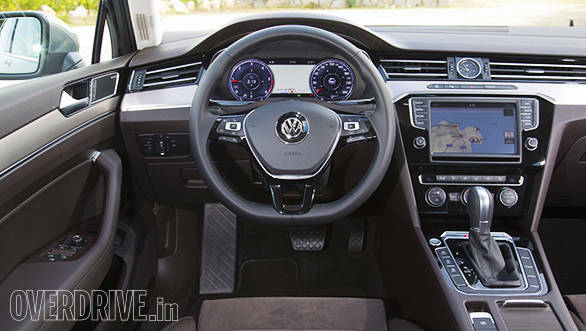 The new Passat also sits on a longer wheelbase and that has given the cabin additional room despite the exteriors being smaller than the outgoing car's. The cabin has a new design theme now with the most eye-catching element being the seamless air-vent design that appears to extend across the entire width of the dashboard fascia. It not only makes the cabin appear wider, but the broad vents also improve cooling efficiency for the four-zone climate control system. Even in the hot and humid climate at the island, the air-conditioning was quick to cool the cabin. The instrumentation on the new Passat replaces the hardware clocks with a large display screen like the one in the new S-Class. It displays all the usual clocks and can switch between readouts for the navigation, vehicle, trip and media information. The screen has a rich resolution and the software on it seems to respond faster than the software for the touchscreen infotainment system. All the controls for these systems are easy to reach for and you don't really need to search for any specific switches or functions. The seats on the Passat are typically German with a fairly stiff cushion underneath. Though the front seats are wide enough, the bolstering around the base was a tad too thick for my generous size. At the back, the seats are contoured pretty nicely and have additional legroom now, thanks to the improvement in cabin space. Despite being marginally lower, the ingress and egress is pretty easy in the new Passat. The fit and finish of the upholstery and cabin elements are top notch and look better in the darker shades than the brighter ones. Both in looks and in the way the Passat behaves on the road, the eighth generation model is a significant improvement over the outgoing model. 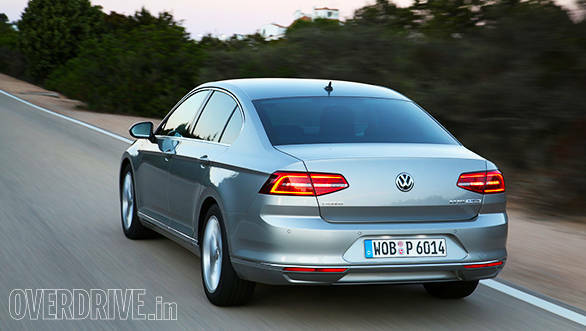 Volkswagen is still undecided on bringing the new Passat to India, but I hope it does. 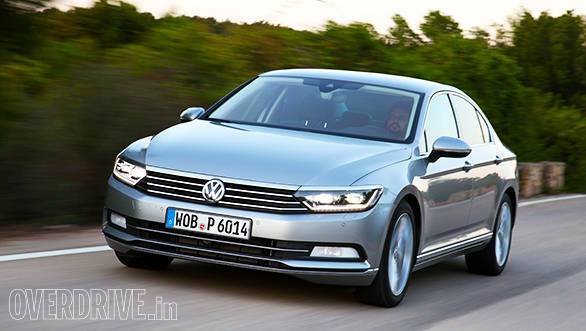 If it does come to India though, the new Passat will face the same problem as its predecessor - sibling rivalry. Audi, and even Mercedes-Benz and BMW, have plenty of entry-level models on offer in the same price bracket as the Passat. So it will have to contend with the brand value of those models. But the way it has been packaged and spec-ed, the Passat actually makes luxury cars belonging to a couple of segments higher, look pointless. So if you are a sensible buyer who wants more value for your money than outright brand value, then the Passat is all the car you need.